The history of surgical anesthesia is a relatively short one--the first known anesthetic, diethyl ether, was used in the mid-19th century. It was sometimes called ethyl ether, or simply ether. This compound, while certainly a welcome addition to medical practice at the time, has since been abandoned as an anesthetic because it has several unpleasant and, in some cases, life-threatening side effects. 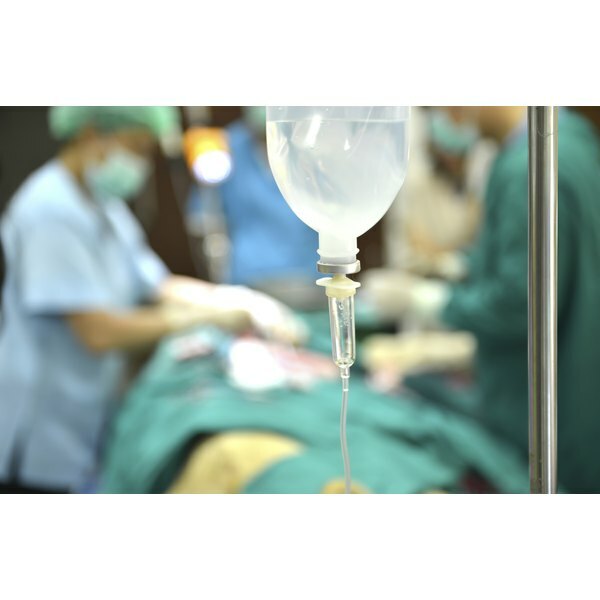 Modern anesthetics provide anesthesia with fewer adverse effects. One of the troubling side effects associated with ether anesthesia is nausea. In a 1969 article published in the "New England Journal of Medicine," Dr. H. Amsden reports on the results of a study conducted to determine the cause of nausea in patients anesthetized with ether. He notes in his findings that ether appears to dramatically increase the secretion of mucus into the stomach, which leads to post-anesthesia feelings of nausea and often vomiting. Amsden further notes that patients experienced ether aftertaste in the mouth for several days following surgery, and found it hard to eat or drink due to both nausea and the taste of the ether. Ether anesthetics are quite hard on the body organs, partially due to the very toxic nature of ether, which affects the liver and kidneys. In a 1993 article in the journal "Proceedings of the Royal Society of Medicine," Dr. R. Minnitt notes that ether anesthesia typically leads to increased blood sugar and falling blood pressure. The increased blood sugar appears to be the result of reduced pancreatic signals to cells to take up sugar from the blood, and increased signals to cells to release sugar into the blood. This can lead to symptoms of cellular energy starvation, manifested as ketosis. Minnitt notes that patients coming out of ether anesthesia with significant symptoms of ketosis, or cellular starvation, benefit from a shot of insulin. The most serious of the dangers associated with ether anesthetic is that of death. Because the LD50, or dose of ether that produces death in 50 percent of the population, is only slightly higher than the dose of ether required to reduce consciousness sufficiently, many patients received accidental overdoses of ether in the course of medical treatment. In a 1896 article published in the "New England Journal of Medicine," Dr. Edgar Garceau discusses the dangers of ether anesthetic, and notes that many patients are brought so close to death in the course of administering the drug that they emerged from anesthetic in a mental stupor, and were quite difficult to awaken.